What? It couldn’t possibly be 5:00 a.m. already, could it? (I’d gone to bed around 1 a.m.) But my phone alarm affirmed it was time to face one of the biggest challenges of my barbecue life: cooking not one, but three whole packer briskets for the finale of a week-long family reunion. And if I’ve learned anything from being Steven Raichlen’s assistant for many years, it’s this: When smoking, allow more time than you think you’ll need. 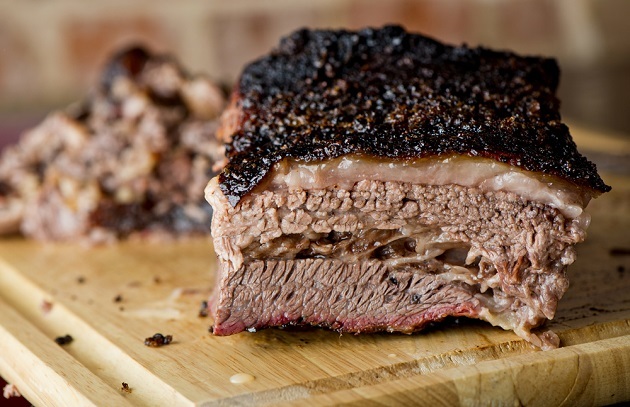 Especially if tender, juicy brisket with a badge-worthy smoke ring and crusty bark is your goal. Oh, and don’t underestimate the amount of meat you’ll need. Going into this mission, I was definitely an armchair quarterback. I’d spent the spring and summer immersed in copy for Steven’s latest book, The Brisket Chronicles, which is scheduled for release in May. And I had a few brisket flats in my wake, not to mention experiences at BBQ University and on the set of Steven’s shows. But I’d never tackled a whole brisket by myself before. By 6 a.m., nearly 40 pounds of meat was bathing in wood smoke. I used soaked and drained hickory chips for both the charcoal grill and the electric smoker. Whew! Time for some coffee, which had a dual purpose: I needed the caffeine, but I also wanted it for a mop sauce that I improvised from coffee, beef broth, and Worcestershire sauce. (I bought a food-safe spray bottle for this purpose. Though you could use an actual mop, such as the one in Steven’s Best of Barbecue line). But we have to backtrack a bit. You can’t just throw a whole packer brisket on the grill or smoker and hope for the best. For starters, there’s a lot of trimming to be done pre-cook. Steven offers concise instructions on how to do it in The Brisket Chronicles (they will be accompanied by photos), but to get a visual, I watched a video of brisket god Aaron Franklin of Austin’s Franklin Barbecue trimming a whole packer brisket before attempting it myself. He doesn’t like sharp edges on his brisket as he says they impede the flow of smoke. So I trimmed my briskets as if I was shaping the leading edges of airplane wings. So, back to the cook. I quit adding wood chips after the first 4 hours, though I periodically sprayed the briskets with the aforementioned mop sauce. I also transferred the supermarket brisket from the kettle grill to the electric smoker, where the other two were hanging out, which absolved me from having to light half chimneys of charcoal every 45 minutes. Now all three briskets were in one place. After 7 hours, the meat hit the “stall,” that place where the juices, like perspiration, accumulate on the surface and slow down heat absorption. It happens between 150 and 165 degrees. 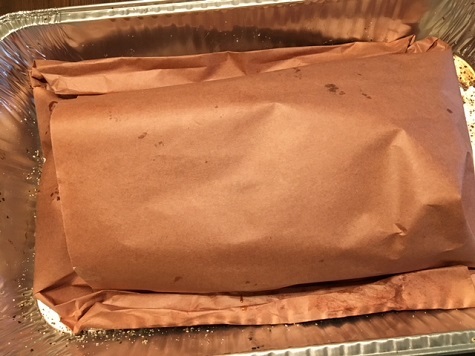 Now is the time to wrap the brisket in butcher paper. 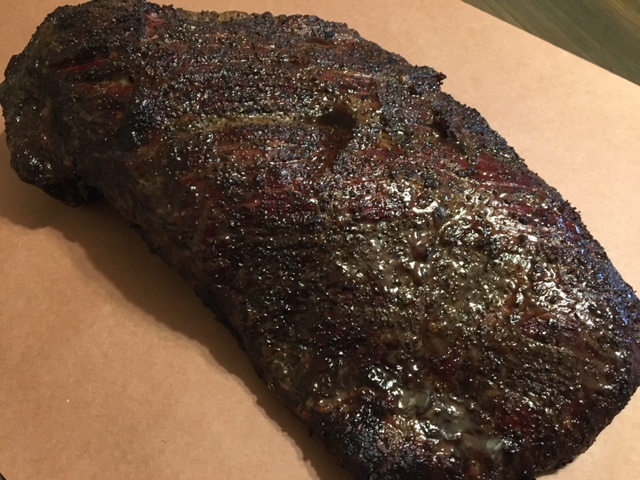 Foil can be used, too, but the permeability of unlined butcher paper makes it a favorite among pit masters. Note: Food-safe insulated rubber gloves are extraordinarily useful at all stages of the brisket process. Once the brisket is wrapped, you can almost relax. Almost. You still have to monitor the temperature of the meat. I would have loved to have had a remote thermometer. But I didn’t. (See army comment above.) So I simply stuck the probe of a cooking thermometer into the thickest part of the meat—the point, aka deckle—to monitor the temperature. The goal was 205 degrees. While the brisket was languishing, I made Steven’s “Three Hots Horseradish Sauce.” I caught my cousin, a trained chef, making a layered brisket sundae of brisket, the sauce, and maybe baked beans. He slinked off before I could check. I dutifully took photos of the entire process on my phone’s camera until . . . all of a sudden . . . everyone wanted to eat! I regret that I didn’t get a shot of the whole finished briskets, but what would you do if the peasants were at the door, brandishing torches and pitchforks? Ya, it was like that. All I had to defend myself with was an electric knife, which incidentally, works great for slicing brisket. Pay close attention to the grain; always slice against it. At the end of the day there was less than 2 pounds of finished meat left. The family devoured it. Steven and I figure on 1 pound of raw brisket per person. But I had a couple of vegetarians in this group, and two children under the age of five. So I think our rule-of-thumb number is spot-on. Allow more time than you think you’ll need. Restaurant-quality aluminum sheet pans work great for handling or transporting large cuts of meat. The ones I bought came with foil lids. The meat will shrink by as much as 40 percent; figure on 1 pound of raw meat per person. Order in advance, then make sure you have room in your refrigerator to store these big hunks of meat. Familiarize yourself with the anatomy of brisket, and how to trim it for grilling. Leave at least 1/4 inch of fat on the surface to keep the meat moisturized during the long cook. If using a charcoal grill or wood-fired smoker, plan on devoting your entire day (and part of the night) to maintaining a constant temperature. You’ll be looking for 225 to 250 degrees. Don’t “over-smoke” your brisket. Exposure to wood smoke for 3 to 4 hours adds flavor without being overwhelming. Do mop with a thin mop sauce to keep your brisket moist. Don’t panic when your brisket hits the “stall,” which generally occurs between 150 and 165 degrees. Resist the impulse to crank up the temperature. 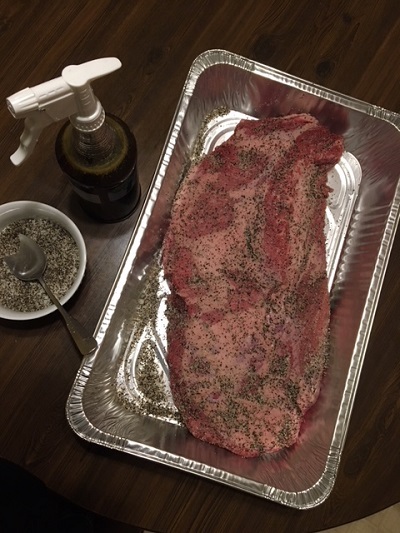 Do season the brisket with your favorite rub the night before your cook for the crustiest bark. Allow 1 to 2 hours for the brisket to rest in an insulated cooler. Use an electric, serrated, or a special brisket knife to slice your brisket. Have any first-time brisket tips? Tell us about it in the comments or on Facebook, Twitter, or the Barbecue Board.